Amoretta is an handwritten typeface created by Crystal Kluge together with Stuart Sandler and published by Tart Workshop which give you little love, feminine touch and a romantic look. This font include handdrawn dingbats, ligatures, alternate glyphs, ornaments offering you endless possibilities. It can be use for both, for print or online applications. Easy to read on small or large scale platforms, you can create a beautiful story with Amoretta! 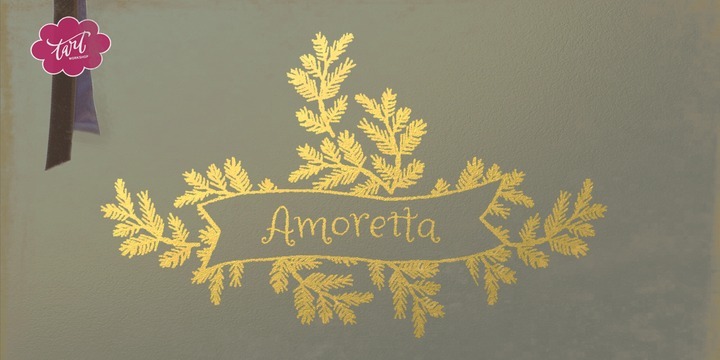 Note: Amoretta is a trademark of Font Diner DBA Tart Workshop. A font description published on Friday, November 14th, 2014 in Crystal Kluge, Fonts, Stuart Sandler, Tart Workshop by Alexandra that has 4,826 views.